When looking for this months gratitude exercise, I wanted to try something a little different. Much like guided meditation, mantras can be a great way of setting a positive, grateful mindset. If you need to tweak the mantras, that is totally ok. I am thankful for my heart - it gets stronger with every run I complete and every time I open it to possibility. I am thankful for my children - they have taught me true joy, compassion, and love like no other. I am thankful for each day that I am here - while I am sometimes scared of what is still to come, I am thankful that I get to be here and make an impact. I am thankful for a man who loves me - my husband who builds me up every single day and embraces who I truly am. I am thankful for the struggles I have faced - they have taught me how strong I truly am, and given me unparalleled perspective. What are you thankful for? 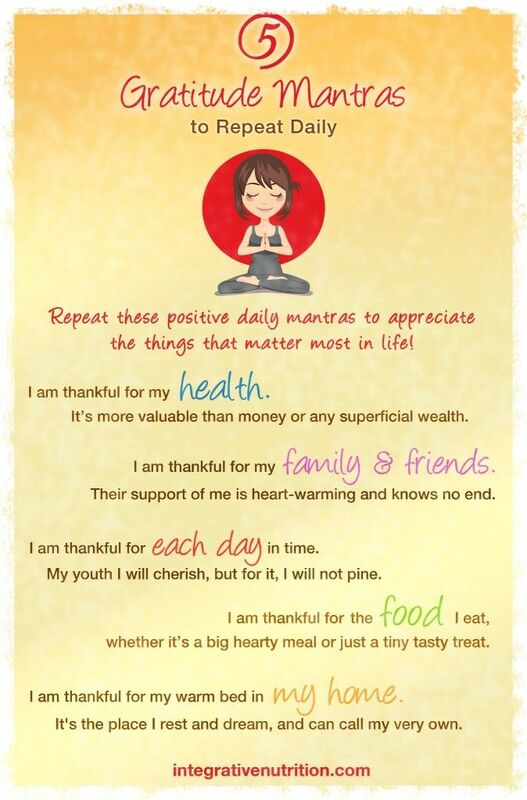 What will your mantras of gratitude be?